At this week’s Encinitas City Council meeting, the hot topic was law enforcement — specifically, whether we need an additional sheriff’s deputy at a cost of about $200,000 a year. The City Council has been actively working on the budget for the last four months (here is my recent op-ed piece on the city’s budget, which we passed unanimously last week). The proposal for another sheriff’s deputy arose unexpectedly on the last night of discussion before approving the budget. On a 3-2 vote (Shaffer/Kranz/Blakespear voting against the additional deputy proposal), we rejected hiring an additional deputy without more analysis on the need for the hire. How much law enforcement does a city need? The answer is just the right amount – enough to keep things safe and ensure order. We already spend almost $28 million a year on law enforcement, which is a third of our total city budget. We live in a relatively safe city. We have a stable population. Crime continues to trend down, according to our sheriff’s captain, even though calls for service are trending up. So do we need to hire additional deputies? I want new expenditures of public money, even for law enforcement, to be narrowly tailored to address clearly stated needs. Our clear need is in downtown Encinitas on weekend nights. The City Council continues to hear reports of drunken, rowdy behavior, loitering, shouting and littering, as well as complaints about the homeless and drug use. But going from 26 to 27 sheriff’s deputies in our sheriff’s contract for a proposed “dedicated two-man beach team” isn’t narrowly tailored to address that problem. Additionally, the sheriff’s captain stated at our meeting that it was unlikely the new hire could be in place for this summer, which is already well underway. Does the solution to downtown’s problems need to be a sheriff’s deputy? And does the person need to be full time? Maybe not. There are hybrid programs in other cities that cost considerably less and target specific problems. Sheriff’s deputies are undoubtedly required for violent and serious crime – murders, armed robbery, rapes. But those aren’t the problems we’re facing downtown. For me, evaluating the fiscal details of law enforcement is crucial – especially given the hefty chunk of change we spend in this category. I want to see the stats before we expand the payroll. We pay for 25.59 deputies. Where do they spend their time, and how much time is spent outside Encinitas in neighboring communities? What is the nature of the increase in the calls for service? What are the actual crime trends in multiple categories? None of this information was available to us at last Wednesday night’s meeting. The meeting produced a healthy and robust debate, with clearly stated contrasting ideologies. Here’s a Coast News article about our decision. I’m grateful Council Members Lisa Shaffer and Tony Kranz are convening a roundtable discussion this coming week to specifically define the downtown problems, come up with benchmarks for success and explore acceptable options. The results of these discussions will be shared with the whole Council to help us make informed decisions. 1. Green Waste Recycling. State law is changing in six months to require all cities to provide a green waste recycling option for businesses such as restaurants and landscaping companies. Encinitas became one of the first cities in the county to proactively tackle this after Council Member Lisa Shaffer and I brought it up as an agenda item. Composting locally allows us to enrich our soils to grown clean, nutritious food without a long supply chain. 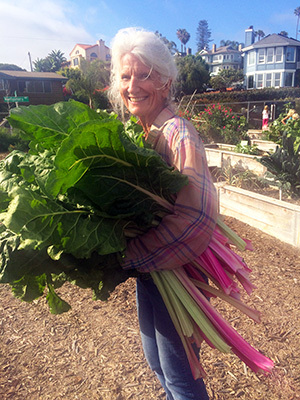 In this photo, my mom, Tricia A. Smith, carries home chard after a garden clean-up at Cardiff School. Here’s a Coast News article about Encinitas’ green waste efforts. 2. We unanimously tabled a proposal to ban alcohol in all city parks. Without clear evidence of a problem, I believe responsible drinking in some public parks should continue to be allowed. Furthermore, policy changes such as this should be vetted through our Parks & Recreation Commission first before coming to us so the public has multiple opportunities to comment, and we have the benefit of the collective opinion of our commissioners. An Encinitas Advocate story about our vote is here. 3. I’m very excited that we’re close to announcing our new city manager — a clear, unanimous choice. If you have Encinitas issues you’d like to share with me, please don’t hesitate to respond to this email and let me know what’s on your mind. 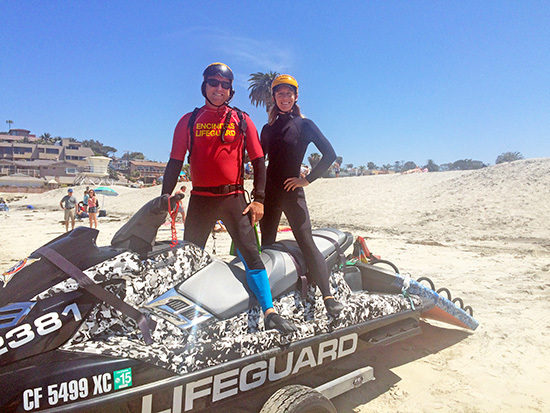 Thank you to Encinitas Marine Safety Captain Larry Giles for taking me on a jet ski to see the 6.5 miles of coastline that we’re responsible for keeping safe. Jet skis are really fun!